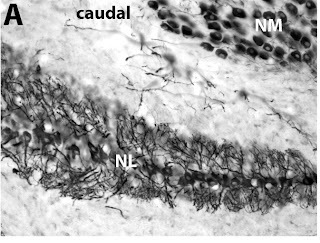 In the last post, we introduced the special football-shaped cells of the bird Nucleus Laminaris (NL). 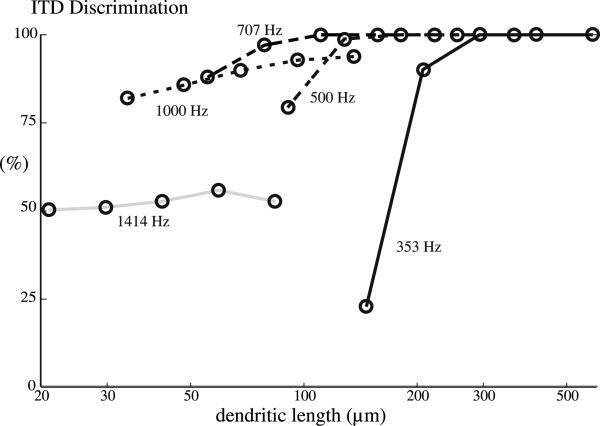 Today we look at how the dendritic length of these neurons dictates the frequencies they are most sensitive to. But first we need to understand what the NL does. When you hear a noise, you can tell what direction it is coming from (for the most part). There are several ways the brain can hone in on the direction of a sound. One of those ways is called the 'inter-aural time difference.' That means the difference between when a sound hits one ear and when it hits the other. For example, imagine you are on a hike in a quiet woods and you hear a leaf-rustling sound to your right. The sound waves from that leaf-rustling actually reach your right ear a fraction of a second before they reach your left ear. 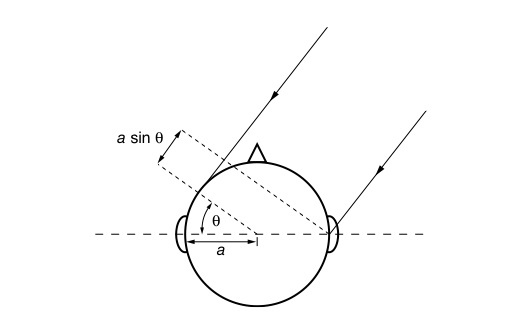 The brain can process this time difference and compute the direction of the sound. Incidentally, birds like the boring-old-chicken and the pretty-cool-barn-owl are particularly good at sound localization. The NL in these birds is where this computation takes place. 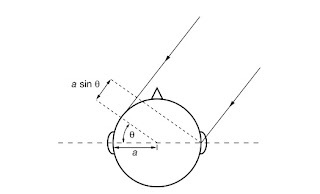 Above is a diagram of the bird auditory brain stem. the NL is the line-like structure on either side. 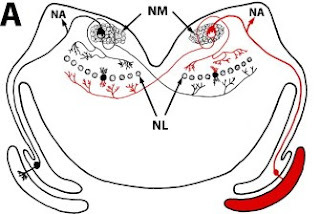 The dendrites on the top of the NL neurons receive input from one ear (the ear on the same side of the head), and the dendrites on the bottom of the NL receive input from the other ear (the one on the opposite side of the head). In the picture above, inputs from one ear are in black and inputs from the other are in red. Since a sound from a particular direction hits one ear first, and then the other ear, the top dendrites of a cell will receive inputs at a slightly different time than the bottom dendrites of that cell. If you remember our last post, you know that the dendrites in the NL are longer near the outside edges of the brain and shorter near the middle. You also will remember that the short-dendrite neurons are sensitive to high frequency sound waves and the long-dendrite neurons are sensitive to lower frequency sound waves. 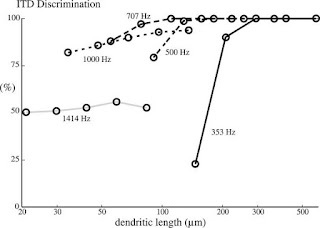 So how do the frequency-tuning properties relate to the dendritic gradient properties? In a computational study, published in Biological Cybernetics, Grau-Serrat et al., (2003) try to answer this question. I thought these passages from their introduction made an excellent summary of computational neuroscience. Now back to the BirdBrain! 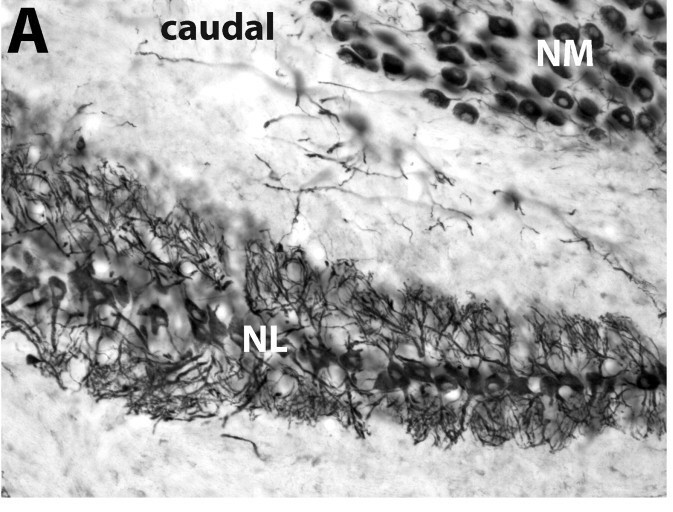 So to answer the 'form and function' question inherent in the NL cells, Grau-Serrat et al. create model NL neurons in a computer program and test them with simulated inputs. Because it is a computational model, they have complete control over the conditions. They can put either short or long dendrites on these cells, and can send in high or low frequency sound waves. They also can send an input to the top layer of dendrites at one time and then send an input to the bottom layer of dendrites milliseconds afterwards. Controlling all these factors, they can test whether the size of the dendrites in these cells helps them accurately detect the timing difference between ears. They can also test whether the frequency of the sound (high or low) has anything to do with timing difference detection. The lower the frequency, the longer the dendrites need to be to show good time discrimination. In their computational model, making the dendrites longer generally improved time discrimination, but for every frequency there was a certain dendritic length that was 'long enough'. Adding more dendrite after a certain length didn't improve the time discrimination. Keep the dendrites as short as possible. Make the dendrites long enough to accurately discriminate time differences. So there you have it, the mystery of the NL dendritic gradient, solved by computational neuroscience. Note: I know this is a pretty complex system, and I am definitely simplifying. If you know a lot about the auditory brainstem, please don't hesitate to correct/expand on what I've written here in a comment. Also if you don't know a lot about this system and have a question, write it in the comments section and I'll try my best to answer it.